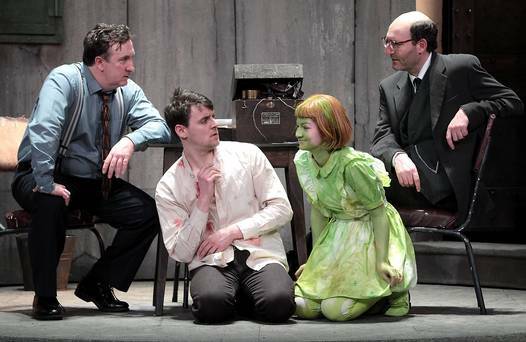 Make no mistake; few plays in recent years have been as dark in tone as The Pillowman, Martin McDonagh’s Olivier award winning play, currently showing at the Gaiety theatre. Indeed as I watched it, a particular scene from This is Spinal Tap kept springing to my mind. When Nigel and the rest of the fictional rock band receive an advanced copy of their latest album sleeve; a morose but artfully plain black cover, the lead singer ruminates: “How much more black could this be? The answer is none…none blacker’. 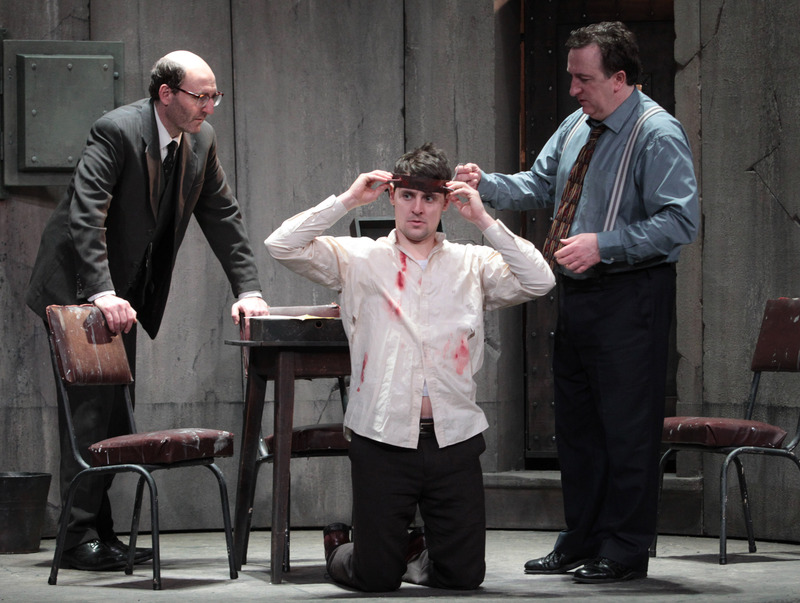 The story begins in an austere police interrogation room where Katurian K. Katurian (Diarmuid Noyes) an aspiring young writer is being grilled by a pair of tightly wound cops, Tupoloski (Peter Gowen) and Ariel (Gary Lydon). The reason for the young man’s detention is not immediately apparent, but it’s clear that his tormentors are holding him for something a little more heinous than crimes against literature. From this moment, McDonagh begins having fun with the audience. We are wrong-footed on more than one occasion as character motivation changes in the blink of an eye. The feeling that this is some kind of absurdist, Kafka-esque (“everything’s ‘esque-something’ nowadays,” observes one character) comedy about thought-suppression by a totalitarian state quickly dissipates when Tupoloski starts questioning Katurian about a series of child killings. The action soon cuts to the cell next door as Katurian’s psychologically damaged Brother Michal (Owen Sharpe) who, along with Katurian, may or may not be responsible for the murders of the children in question. The killings bear more than a passing resemblance to those described in several of Katurian’s short stories. What unfolds is a desperate, often bleakly funny, quest for the truth as Katurian valiantly tries to make sense of his predicament while an appointment with the local executioner and his revolver draws ever closer. 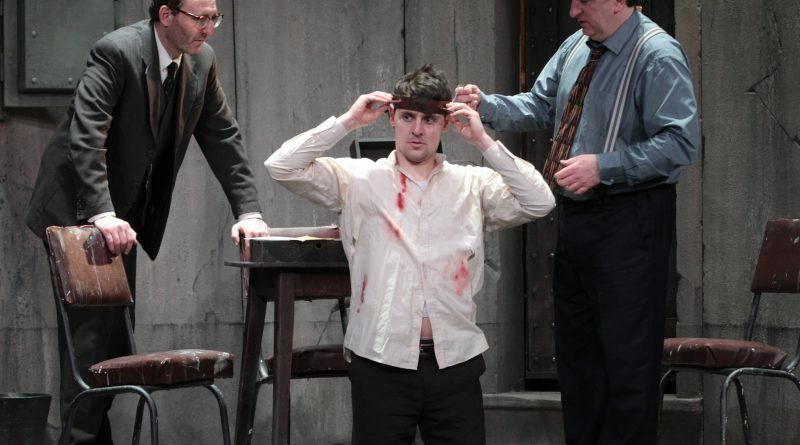 Those familiar with McDonagh’s previous work (in film, In Bruges, Seven Psychopaths and on stage, the Cripple of Inishmaan, Hangmen) will recognise familiar themes. Conflict of loyalties, childhood abuse, the unlikely juxtaposition of horror and comedy. Though we are invited to laugh, the tone here is closer to that of 2014’s oblique and foreboding Calvary, made by McDonagh’s brother, John Michael. Indeed, if you are familiar with that film, you will recognise several members of the cast here, namely Lydon and Sharpe, who are both excellent as the tough-as-nails cop with an unlikely soft side and disturbed younger sibling respectively. Owen MacCarthaigh’s striking set design gives the work that distinctive feel of a Brothers Grimm tale, and he makes the interrogation room look like the last pit stop on the way to Hell. Director Andrew Flynn skilfully accommodates all of the writer’s themes, deftly utilising a backdrop that illustrates the macabre nature of the brothers’ childhood. 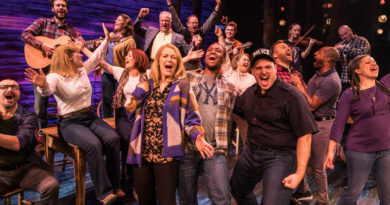 At the heart of the play is a pertinent question about where the writer’s responsibility truly lies. Should the writer be mindful about creating monsters on the page because if he’s not careful, he could unwittingly inspire monsters in real life? The play is not without minor flaws. McDonagh undoubtedly has a flair for comic dialogue and monologues, but here he allows certain rifts to outstay their welcome, and whether or not child murder is a topic for even glib humour is down to personal taste. But this is still a haunting and worthwhile experience with images that linger in the mind long after the curtain has fallen.